Hindu calendar is a collective term for the various lunisolar calendars traditionally used in the Indian subcontinent. They adopt a similar underlying concept for timekeeping, but differ in their relative emphasis to moon cycle or the sun cycle and the names of months and when they consider the New Year to start. Of the various regional calendars, the most studied and known Hindu calendars are the Shalivahana Shaka found in South India, Vikram Samvat (Bikrami) found in North and Central regions of India, Tamil calendar used in Tamil Nadu, and the Bengali calendar used in the Bengal – all of which emphasize the lunar cycle. Their new year starts in spring. In contrast, in regions such as Kerala, the solar cycle is emphasized and this is called the Malayalam calendar, their new year starts in autumn, and these have origins in the second half of the 1st millennium CE. A Hindu calendar is sometimes referred to as Panchanga (पञ्चाङ्ग). The ancient Hindu calendar conceptual design is also found in the Jewish calendar, but different from the Gregorian calendar. Unlike Gregorian calendar which adds additional days to lunar month to adjust for the mismatch between twelve lunar cycles (354 lunar days) and nearly 365 solar days, the Hindu calendar maintains the integrity of the lunar month, but insert an extra full month by complex rules, every few years, to ensure that the festivals and crop-related rituals fall in the appropriate season. The Hindu calendars have been in use in the Indian subcontinent since ancient times, and remains in use by the Hindus in India and Nepal particularly to set the Hindu festival dates such as Holi, Maha Shivaratri, Vaisakhi, Raksha Bandhan, Pongal, Onam, Krishna Janmashtami, Durga Puja, Ram Navami, Pana Sankranti, Vishu and Diwali. Early Buddhist communities of India adopted the ancient Indian calendar, later Vikrami calendar and then local Buddhist calendars. Buddhist festivals continue to be scheduled according to a lunar system. The Buddhist calendar and the traditional lunisolar calendars of Cambodia, Laos, Myanmar, Sri Lanka and Thailand are also based on an older version of the Hindu calendar. Similarly, the ancient Jain traditions have followed the same lunisolar system as the Hindu calendar for festivals, texts and inscriptions. However, the Buddhist and Jain timekeeping systems have attempted to use the Buddha and the Mahavira's lifetimes as their reference points. The Hindu calendar is also important to the practice of Hindu astrology and zodiac system. Time keeping was important to Vedic rituals, and Jyotisha was the Vedic era field of tracking and predicting the movements of astronomical bodies in order to keep time, in order to fix the day and time of these rituals. This study was one of the six ancient Vedangas, or ancillary science connected with the Vedas – the scriptures of Hinduism. The ancient Indian culture developed a sophisticated time keeping methodology and calendars for Vedic rituals. David Pingree has proposed that the field of timekeeping in Jyotisha may have been "derived from Mesopotamia during the Achaemenid period", but Yukio Ohashi considers this proposal as "definitely wrong". Ohashi states that this Vedanga field developed from actual astronomical studies in ancient India. The texts of Vedic Jyotisha sciences were translated into the Chinese language in the 2nd and 3rd centuries CE, and the Rigvedic passages on astronomy are found in the works of Zhu Jiangyan and Zhi Qian. Timekeeping as well as the nature of solar and moon movements are mentioned in Vedic texts. For example, Kaushitaki Brahmana chapter 19.3 mentions the shift in the relative location of the sun towards north for 6 months, and south for 6 months. The Vikrami calendar is named after king Vikramaditya and starts in 57 BCE. Sanathana Dharma (Hindu) scholars kept precise time by observing and calculating the cycles of (Surya) i.e. the sun, moon and the planets. These calculations about the sun appear in various astronomical texts in Sanskrit, such as the 5th-century Aryabhatiya by Aryabhata, the 6th-century Romaka by Latadeva and Panca Siddhantika by Varahamihira, the 7th-century Khandakhadyaka by Brahmagupta and the 8th-century Sisyadhivrddida by Lalla. These texts present Surya and various planets and estimate the characteristics of the respective planetary motion. Other texts such as Surya Siddhanta dated to have been completed sometime between the 5th century and 10th century present their chapters on various deified planets with stories behind them. Smskrth (Sanskrit) texts: How many days in a year? The Hindu texts used the lunar cycle for setting months and days, but the solar cycle to set the complete year. This system is similar to the Jewish and Babylonian ancient calendars, creating the same challenge of accounting for mismatch between the nearly 354 lunar days in twelve months, versus nearly 365 solar days in a year. They tracked the solar year by observing the entrance and departure of surya (sun, at sunrise and sunset) in the constellation formed by stars in the sky, which they divided into 12 intervals of 30 degrees each. Like other ancient human cultures, Hindus innovated a number of systems of which intercalary months became most used, that is adding another month every 32.5 months on average. As their calendar keeping and astronomical observations became more sophisticated, the Hindu calendar became more sophisticated with complex rules and greater accuracy. According to Scott Montgomery, the siddhanta tradition at the foundation of Hindu calendars predate the Christian era, once had 18 texts of which only 5 have survived into the modern era. These texts provide specific information and formulae on motions of sun, moon and planets, to predict their future relative positions, equinoxes, rise and set, with corrections for prograde, retrograde motions, as well as parallax. These ancient scholars attempted to calculate their time to the accuracy of a truti (29.63 microseconds). In their pursuit of accurate tracking of relative movements of celestial bodies for their calendar, they had computed the diameter of earth, which was very close to the actual 7,918 miles. Hindu calendars were refined during the Gupta era astronomy by Āryabhaṭa and Varāhamihira in the 5th to 6th century. These in turn were based in the astronomical tradition of Vedāṅga Jyotiṣa, which in the preceding centuries had been standardised in a number of (non-extant) works known as Sūrya Siddhānta. Regional diversification took place in the medieval period. The astronomical foundations were further developed in the medieval period, notably by Bhāskara II (12th century). Later, the term Jyotisha evolved to include Hindu astrology. The astrological application of the Hindu calendar was a field that likely developed in the centuries after the arrival of Greek astrology with Alexander the Great, because their zodiac signs are nearly identical. The ancient Hindu texts on Jyotisha only discuss time keeping, and never mention astrology or prophecy. These ancient texts predominantly cover astronomy, but at a rudimentary level. Technical horoscopes and astrology ideas in India came from Greece, states European specialist Nicholas Campion, and developed in the early centuries of the 1st millennium CE. Later medieval era texts such as the Yavana-jataka and the Siddhanta texts are more astrology-related. Hinduism and Buddhism were the prominent religions of southeast Asia in the 1st millennium CE, prior to the Islamic conquest that started in the 14th century. The Hindus prevailed in Bali, Indonesia and they have two types of Hindu calendar. One is a 210-day based Pawukon calendar which likely is a pre-Hindu system, and another is similar to lunisolar calendar system found in South India and it is called the Balinese saka calendar which uses Hindu methodology. The names of month and festivals of Balinese Hindus for the most part are different, though the significance and legends have some overlap. Samvat refers to era of the several Hindu calendar systems in India and Nepal, in a manner that the consecutive years 1 BC and AD 1 mark the Christian era and the BC/AD system. There are several samvat found in historic Buddhist, Hindu and Jaina texts and epigraphy, of which three are most significant: Vikrama era, Old Shaka era and Shaka era of 78 AD. Vikram Samvat: A northern India almanac which started in 57 BCE, and is also called the Vikrama Era. It is related to the Bikrami calendar, and is linked to Vikramaditya. This system is common in epigraphic evidence from northern, western, central and eastern Indian subcontinent, particularly after the early centuries of the 1st millennium CE. Shaka Samvat: There are two Shaka era system in scholarly use, one is called Old Shaka Era, whose epoch is uncertain, probably sometime in the 1st millennium BCE because ancient Buddhist, Jaina and Hindu inscriptions and texts use it. However, the starting point of Old Shaka Era is a subject of dispute among scholars. The second system is called Saka Era of 78 AD, or simply Saka Era, a system that is common in epigraphic evidence from southern India. Saka era of Southeast Asia: The Hindu calendar system in Indonesia is attributed to the legend of Hindus arriving with a sage Aji Saka in the 1st century Java, in the March of 78 CE. Numerous ancient and medieval era texts and inscriptions found in Indonesian islands use this reference year. 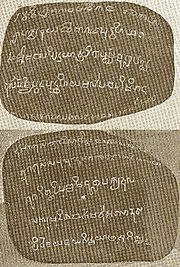 In mainland southeast Asia, the earliest verifiable use of Hindu Saka methodology in inscriptions is marked Saka 533 in Ankor Borei, which corresponds to 611 CE, while in the Indonesian islands, the Kedukan Bukti inscription in Sumatra, marked to Saka 605 (683 CE) is one of the earliest known. However, these inscriptions set the floruit, and the Hindu calendaring methodology likely existed in southeast Asia before these dates to be used in important monuments. Further, the Hindu calendar system remained popular among the Hindus through about the 15th century, and thereafter in Bali Indonesia. Indian national calendar (modern): combined many Hindu calendars into one official standardized one, but old ones remain in use. Two traditions have been followed in the Indian subcontinent with respect to lunar months: Amanta tradition which ends the lunar month on no moon day, while Purnimanta tradition which ends it on full moon day. Amavasyant (Amanta, Mukhyamana) tradition is followed by all Indian states that have a peninsular coastline (except Odisha), as well as Assam and Tripura.The states are Gujarat,Maharashtra,Karnataka,Kerala,Tamilnadu,Andhra pradesh,Telangana, and West Bengal.Odisha and all other states follow the Purnimanta (Gaunamana) tradition. Purnimanta tradition was being followed in the Vedic era. It was replaced with Amanta system and in use as the Hindu calendar system prior to 1st century BCE, but the Purnimanta tradition was restarted in 57 BCE by Vikramaditya who wanted to return to the Vedic roots. The presence of this system is one of the factors considered in dating ancient manuscripts and epigraphical evidence of India that have survived into the modern era. A month contains two fortnights called pakṣa (पक्ष, literally "side"). One fortnight is the bright, waxing half where the moon size grows and it ends in the full moon. This is called Shukla Paksha. The other half is the darkening, waning fortnight which ends in the new moon. The Hindu festivals typically are either on or the day after the full moon night, or the darkest night (amavasya, अमावास्या), except for some associated with Krishna, Durga or Rama. The lunar months of the hot summer and the busy major cropping-related part of the monsoon season typically do not schedule major festivals. A combination of the Paksha system, and the two traditions of Amanta and Purnimanta systems, has led to alternate ways of dating any festival or event in the historic Hindu, Buddhist or Jain literature, and contemporary regional literature or festival calendars. For example, the Hindu festival of colors called Holi falls on the first day (full moon) of Chaitra lunar month's dark fortnight in the Purnimanta system, while the same exact day for Holi is expressed in Amanta system as the Purnima (full moon) lunar day of Phalguna. Both time measuring and dating systems are equivalent ways of meaning the same thing, they continue to be in use in different regions, though the Purnimanta system is now typically assumed as implied in modern Indology literature if not specified. The names of the Indian months vary by region. Despite the significant differences between Indo-European languages and Dravidian languages, those Hindu calendars which are based on lunar cycle are generally phonetic variants of each other, while the solar cycle are generally variants of each other too, suggesting that the time keeping knowledge travelled widely across the Indian subcontinent in ancient times. Twelve Hindu mas (māsa, lunar month) are equal to approximately 354 days, while the length of a sidereal (solar) year is about 365 days. This creates a difference of about eleven days, which is offset every (29.53/10.63) = 2.71 years, or approximately every 32.5 months. The twelve months are subdivided into six lunar seasons timed with the agriculture cycles, blooming of natural flowers, fall of leaves, and weather. To account for the mismatch between lunar and solar calendar, the Hindu scholars adopted intercalary months, where a particular month just repeated. The choice of this month was not random, but timed to sync back the two calendars to the cycle of agriculture and nature. The repetition of a month created the problem of scheduling festivals, weddings and other social events without repetition and confusion. This was resolved by declaring one month as Shudha (pure, clean, regular, proper, also called Deva month) and the other Mala or Adhika (extra, unclean and inauspicious, also called Asura masa). The Indian mathematicians who calculated the best way to adjust the two years, over long periods of a yuga (era, tables calculating 1000 of years), they determined that the best means to intercalate the months is to time the intercalary months on a 19-year cycle. This intercalation is generally adopted in the 3rd, 5th, 8th, 11th, 14th, 16th and 19th year of this cycle. Further, the complex rules rule out the repetition of Mārgasirsa (also called Agahana), Pausha and Maagha lunar months. The historic Hindu texts are not consistent on these rules, with competing ideas flourishing in the Hindu culture. The Hindu calendar makes further rare adjustments, over a cycle of centuries, where a certain month is considered kshaya month (dropped). This occurs because of the complexity of the relative lunar, solar and earth movements. According to the Hindu calendar theory, states uriel Marion Underhill, "when the sun is in perigee, and a lunar month being at its longest, if the new moon immediately precedes a samkranti, then the first of the two lunar months is deleted (called nija or kshaya). This, for example, happened in the year 1 BCE, when there was no new moon between Makara samkranti and Kumbha samkranti, and the month of Pausha was dropped. Just like months, the Hindu calendar has two measures of a day, one based on the lunar movement and the other on solar. The solar day or civil day, called divasa ( दिवस), has been what most Hindus traditionally use, is easy and empirical to observe, by poor and rich, with or without a clock, and it is defined as the period from one sunrise to another. The lunar day is called tithi (तिथि), and this is based on complicated measures of lunar movement. A lunar day or tithi may, for example, begin in the middle of an afternoon and end next afternoon. Both these days do not directly correspond to a mathematical measure for a day such as equal 24 hours of a solar year, a fact that the Hindu calendar scholars knew, but the system of divasa was convenient for the general population. The tithi have been the basis for timing rituals and festivals, while divasa for everyday use. The Hindu calendars adjust the mismatch in divasa and tithi, using a methodology similar to the solar and lunar months. A Tithi is technically defined in Indian texts, states John E. Cort, as "the time required by the combined motions of the sun and moon to increase (in a bright fortnight) or decrease (in a dark fortnight) their relative distance by twelve degrees of the zodiac. These motions are measured using a fixed map of celestial zodiac as reference, and given the elliptical orbits, a duration of a tithi varies between 21.5 and 26 hours, states Cort. However, in the Indian tradition, the general population's practice has been to treat a tithi as a solar day between one sunrise to next. A lunar month has 30 tithi. The technical standard makes each tithi contain different number of hours, but helps the overall integrity of the calendar. Given the variation in the length of a solar day with seasons, and moon's relative movements, the start and end time for tithi varies over the seasons and over the years, and the tithi adjusted to sync with divasa periodically with intercalation. Vāsara refers to the weekdays in Sanskrit. Also referred to as Vara and used as a suffix. The correspondence between the names of the week in Hindu and other Indo-European calendars are exact. This alignment of names probably took place sometime during the 3rd century CE. The weekday of a Hindu calendar has been symmetrically divided into 60 ghatika (= 24 hours), each ghatika is divided into 60 pala (= 24 minutes), each pala is subdivided into 60 vipala (= 24 seconds), and so on. ^ Punjabi Muslims use Urdu/Arabic words for Friday / Saturday etc. The term -vāsara is often realised as vāra or vaar in Sanskrit-derived and influenced languages. There are many variations of the names in the regional languages, mostly using alternate names of the celestial bodies involved. The complete Indian calendars contain five angas or parts of information: lunar day (tithi), solar day (diwas), asterism (naksatra), planetary joining (yoga) and astronomical period (karanam). This structure gives the calendar the name Panchangam. The first two are discussed above. Again, minor variations may exist. The yoga that is active during sunrise of a day is the prevailing yoga for the day. Since the tithis are 30 in number, and since 1 tithi = 2 karaṇas, therefore one would logically expect there to be 60 karaṇas. But there are only 11 such karaṇas which fill up those slots to accommodate for those 30 tithis. There are actually 4 "fixed" (sthira) karaṇas and 7 "repeating" (cara) karaṇas. Now the first half of the 1st tithi (of Śukla Pakṣa) is always Kiṃtughna karaṇa. Hence this karaṇa' is "fixed". Next, the 7-repeating karaṇas repeat eight times to cover the next 56 half-tithis. Thus these are the "repeating" (cara) karaṇas. The 3 remaining half-tithis take the remaining "fixed" karaṇas in order. Thus these are also "fixed" (sthira). Thus one gets 60 karaṇas from those 11 preset karaṇas. The Vedic day begins at sunrise. The karaṇa at sunrise of a particular day shall be the prevailing karaṇa for the whole day. Nakshatras are divisions of ecliptic, each 13° 20', starting from 0° Aries. The purnima of each month is synchronised with a nakshatra. Many holidays in the Hindu, Buddhist and Jaina traditions are based on the lunar cycles in the lunisolar timekeeping with foundations in the Hindu calendar system. A few holidays, however, are based on the solar cycle, such as the Vaisakhi, Pongal and those associated with Sankranti. The dates of the lunar cycle based festivals vary significantly on the Gregorian calendar and sometimes as much as weeks. The solar cycle based ancient Indian festivals almost always fall on the same Gregorian date every year and if they vary in an exceptional year, it is by one day. The Indian Calendar Reform Committee, appointed in 1952, identified more than thirty well-developed calendars, in use across different parts of India. Variants include the lunar emphasizing Vikrama, the Shalivahana calendars, as well as the solar emphasizing Tamil calendar and Malayalam calendar. The two calendars most widely used today are the Vikrama calendar, which is in followed in western and northern India as well as Nepal, and the Shalivahana Shaka calendar which is followed in the Deccan region of India (Comprising present day Indian states of Telangana, Andhra Pradesh, Karnataka, Maharashtra, and Goa). ^ a b c d B. Richmond (1956). Time Measurement and Calendar Construction. Brill Archive. pp. 80–82. Retrieved 18 September 2011. ^ a b c d Christopher John Fuller (2004). The Camphor Flame: Popular Hinduism and Society in India. Princeton University Press. pp. 109–110. ISBN 978-0-69112-04-85. ^ Klaus K. Klostermaier (2007). A Survey of Hinduism: Third Edition. State University of New York Press. p. 490. ISBN 978-0-7914-7082-4. ^ a b c Eleanor Nesbitt (2016). Sikhism: a Very Short Introduction. Oxford University Press. pp. 122–123. ISBN 978-0-19-874557-0. ^ Orazio Marucchi (2011). Christian Epigraphy: An Elementary Treatise with a Collection of Ancient Christian Inscriptions Mainly of Roman Origin. Cambridge University Press. p. 289. ISBN 978-0-521-23594-5. , Quote: "the lunar year consists of 354 days". ^ Anita Ganeri (2003). Buddhist Festivals Through the Year. BRB. pp. 11–12. ISBN 978-1-58340-375-4. ^ Jeffery D Long (2013). Jainism: An Introduction. I.B.Tauris. pp. 6–7. ISBN 978-0-85771-392-6. ^ John E. Cort (2001). Jains in the World: Religious Values and Ideology in India. Oxford University Press. pp. 142–146. ISBN 978-0-19-513234-2. ^ Robert E. Buswell Jr.; Donald S. Lopez Jr. (2013). The Princeton Dictionary of Buddhism. Princeton University Press. p. 156. ISBN 978-1-4008-4805-8. ^ Kim Plofker 2009, p. 36. ^ a b Monier Monier-Williams (1923). A Sanskrit–English Dictionary. Oxford University Press. p. 353. ^ a b Friedrich Max Müller (1860). A History of Ancient Sanskrit Literature. Williams and Norgate. pp. 210–215. ^ Kim Plofker 2009, pp. 10, 35–36, 67. ^ Pingree 1973, pp. 1–12. ^ Yukio Ohashi 1999, p. 719. ^ a b Yukio Ohashi 1999, pp. 719–721. ^ Pingree 1973, p. 2. ^ Yukio Ohashi 1993, pp. 185–251. ^ Yukio Ohashi 1999, p. 720. ^ Kim Plofker 2009, pp. 35–42. ^ Eleanor Nesbitt (2016). Sikhism: a Very Short Introduction. Oxford University Press. pp. 122, 142. ISBN 978-0-19-874557-0. ^ a b c Ebenezer Burgess (1989). P Ganguly, P Sengupta (ed.). Sûrya-Siddhânta: A Text-book of Hindu Astronomy. Motilal Banarsidass (Reprint), Original: Yale University Press, American Oriental Society. pp. vii–xi. ISBN 978-81-208-0612-2. ^ Lionel D. Barnett (1994). Antiquities of India: An Account of the History and Culture of Ancient Hindustan. Asian Educational Services. pp. 190–192. ISBN 978-81-206-0530-5. ^ Ebenezer Burgess (1989). P Ganguly, P Sengupta (ed.). Sûrya-Siddhânta: A Text-book of Hindu Astronomy. Motilal Banarsidass (Reprint), Original: Yale University Press, American Oriental Society. pp. ix–xi, xxix. ISBN 978-81-208-0612-2. ^ J Fleet (1911). Arbhatiya. Journal of the Royal Asiatic Society of Great Britain and Ireland. Cambridge University Press for the Royal Asiatic Society. pp. 794–799. ^ a b Ebenezer Burgess (1989). P Ganguly, P Sengupta (ed.). Sûrya-Siddhânta: A Text-book of Hindu Astronomy. Motilal Banarsidass (Reprint), Original: Yale University Press, American Oriental Society. pp. 26–27. ISBN 978-81-208-0612-2. ^ a b c d e f g Scott L. Montgomery; Alok Kumar (2015). A History of Science in World Cultures: Voices of Knowledge. Routledge. pp. 103–106. ISBN 978-1-317-43906-6. ^ a b c d e f g Nachum Dershowitz; Edward M. Reingold (2008). Calendrical Calculations. Cambridge University Press. pp. 123–133, 275–311. ISBN 978-0-521-88540-9. ^ a b c d e f Christopher John Fuller (2004). The Camphor Flame: Popular Hinduism and Society in India. Princeton University Press. pp. 291–293. ISBN 978-0-69112-04-85. ^ Pingree 1973, pp. 2–3. ^ Erik Gregersen (2011). The Britannica Guide to the History of Mathematics. The Rosen Publishing Group. p. 187. ISBN 978-1-61530-127-0. ^ C. K. Raju (2007). Cultural Foundations of Mathematics. Pearson. p. 205. ISBN 978-81-317-0871-2. ^ Nicholas Campion (2012). Astrology and Cosmology in the World’s Religions. New York University Press. pp. 110–111. ISBN 978-0-8147-0842-2. ^ Kim Plofker 2009, pp. 116–120, 259–261. ^ a b Nachum Dershowitz; Edward M. Reingold (2008). Calendrical Calculations. Cambridge University Press. pp. 123–133, 153–161, 275–311. ISBN 978-0-521-88540-9. ^ a b c Richard Salomon (1998). Indian Epigraphy: A Guide to the Study of Inscriptions in Sanskrit, Prakrit, and the other Indo-Aryan Languages. Oxford University Press. pp. 181–183. ISBN 978-0-19-535666-3. ^ Colette Caillat; J. G. de Casparis (1991). Middle Indo-Aryan and Jaina Studies. BRILL. p. 36. ISBN 90-04-09426-1. ^ Andrea Acri (2016). Esoteric Buddhism in Mediaeval Maritime Asia: Networks of Masters, Texts, Icons. ISEAS-Yusof Ishak Institute. pp. 256–258. ISBN 978-981-4695-08-4. ^ Duncan Graham (2004). The People Next Door: Understanding Indonesia. University of Western Australia Press. pp. 16–17. ISBN 978-1-920694-09-8. ^ J. Gordon Melton (2011). Religious Celebrations: An Encyclopedia of Holidays, Festivals, Solemn Observances, and Spiritual Commemorations. ABC-CLIO. pp. 652–653. ISBN 978-1-59884-205-0. ^ M. C. Ricklefs; P. Voorhoeve; Annabel Teh Gallop (2014). Indonesian Manuscripts in Great Britain: A Catalogue of Manuscripts in Indonesian Languages in British Public Collections. Yayasan Pustaka Obor Indonesia. pp. 49, 69–73, 81. ISBN 978-979-461-883-7. ^ a b c J. G. De Casparis (1978). Indonesian Chronology. BRILL Academic. pp. 15–24. ISBN 90-04-05752-8. ^ a b c d Klaus K. Klostermaier (2007). A Survey of Hinduism: Third Edition. State University of New York Press. pp. 490–492. ISBN 978-0-7914-7082-4. ^ a b Drik Panchang (25 May 2016). "Difference between North Indian and South Indian Lunar Calendar". Retrieved 25 May 2016. ^ a b c V. R. Ramachandra Dikshitar (1993). The Gupta Polity. Motilal Banarsidass. pp. 24–35. ISBN 978-81-208-1024-2. ^ D. C. Sircar (1965). Indian Epigraphy. Motilal Banarsidass. pp. 304–305 with footnotes. ISBN 978-81-208-1166-9. ^ Christopher John Fuller (2004). The Camphor Flame: Popular Hinduism and Society in India. Princeton University Press. pp. 109–110, 291–293. ISBN 978-0-69112-04-85. ^ Muriel Marion Underhill (1991). The Hindu Religious Year. Asian Educational Services. pp. 20, 32 note 5. ISBN 978-81-206-0523-7. ^ Robert Sewell; Śaṅkara Bālakr̥shṇa Dīkshita. The Indian Calendar. S. Sonnenschein. pp. 29–34, 48–56. ^ Muriel Marion Underhill (1991). The Hindu Religious Year. Asian Educational Services. pp. 20–21. ISBN 978-81-206-0523-7. ^ Muriel Marion Underhill (1991). The Hindu Religious Year. Asian Educational Services. pp. 23, 26–27. ISBN 978-81-206-0523-7. ^ Muriel Marion Underhill (1991). The Hindu Religious Year. Asian Educational Services. pp. 27–28. ISBN 978-81-206-0523-7. ^ a b c John E. Cort (2001). Jains in the World: Religious Values and Ideology in India. Oxford University Press. pp. 228 note 2. ISBN 978-0-19-513234-2. ^ Muriel Marion Underhill (1991). The Hindu Religious Year. Asian Educational Services. pp. 23–28. ISBN 978-81-206-0523-7. ^ a b c Muriel Marion Underhill (1991). The Hindu Religious Year. Asian Educational Services. pp. 24–25. ISBN 978-81-206-0523-7. ^ a b Roshen Dalal (2010). Hinduism: An Alphabetical Guide. Penguin Books. p. 89. ISBN 978-0-14-341421-6. ^ Tej Bhatia (2013). Punjabi. Routledge. pp. 208–209. ISBN 978-1-136-89460-2. ^ Ebenezer Burgess (1989). Sûrya-Siddhânta: A Text-book of Hindu Astronomy. Motilal Banarsidass. pp. 107–. ISBN 978-81-208-0612-2. ^ Peter J. Claus; Sarah Diamond; Margaret Ann Mills (2003). South Asian Folklore: An Encyclopedia : Afghanistan, Bangladesh, India, Nepal, Pakistan, Sri Lanka. Taylor & Francis. pp. 91–93. ISBN 978-0-415-93919-5. ^ Robert Sewell; Śaṅkara Bālakr̥shṇa Dīkshita (1896). The Indian Calendar: With Tables for the Conversion of Hindu and Muhammadan Into A.D. Dates, and Vice Versa. S. Sonnenschein. pp. 9–12. ^ Muriel Marion Underhill (1921). The Hindu Religious Year. Association Press. p. 15. Kim Plofker (2009). Mathematics in India. Princeton University Press. ISBN 0-691-12067-6. Pingree, David (1973). "The Mesopotamian Origin of Early Indian Mathematical Astronomy". Journal for the History of Astronomy. SAGE. 4 (1). Bibcode:1973JHA.....4....1P. doi:10.1177/002182867300400102. Pingree, David (1981). Jyotihśāstra : Astral and Mathematical Literature. Otto Harrassowitz. ISBN 978-3447021654. Yukio Ohashi (1999). Johannes Andersen (ed.). Highlights of Astronomy, Volume 11B. Springer Science. ISBN 978-0-7923-5556-4. Yukio Ohashi (1993). "Development of Astronomical Observations in Vedic and post-Vedic India". Indian Journal of History of Science. 28 (3). Maurice Winternitz (1963). History of Indian Literature, Volume 1. Motilal Banarsidass. ISBN 978-81-208-0056-4. S. Balachandra Rao, Indian Astronomy: An Introduction, Universities Press, Hyderabad, 2000. Rai Bahadur Pandit Gaurishankar Hirachand Ojha, The Paleography of India, 2 ed., Ajmer, 1918, reprinted Manshuram Manoharlal publishers, 1993. This page is based on the Wikipedia article Hindu calendar; it is used under the Creative Commons Attribution-ShareAlike 3.0 Unported License (CC-BY-SA). You may redistribute it, verbatim or modified, providing that you comply with the terms of the CC-BY-SA.